Tauʻolunga komipiuta always has had a Tongan keyboard to easily type in the fakauʻa, toloi and fakamamafa, and Tongan fonts to show them. In former times this required all type of tricks. 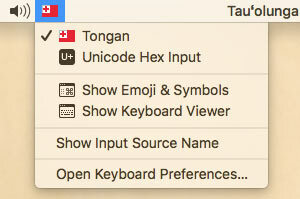 Nowadays, most standard fonts come with almost any accent you may think of, and with the introduction of Macos 10.13, High Sierra, now also the Tongan keyboard is part of the system. On this page we will tell you about its secrets. Select the keyboard from the keyboard menu. If not yet there, add it to the list in System preferences > Language & Region > Keyboard preferences. The normal Tongan keyboard. So far nothing exciting, it is just a standard QWERTY keyboard, except for the fakauʻa, on the upperleft key (where ` was). Do not use the apostrophe as fakauʻa. Use 'show keyboard viewer' from the keyboard menu to see it in a larger scale. Only used for special commands, they do not type anything, so do not bother about them. Now we get interesting. There are some dead keys which unlock other symbols (orange, see there), and some special symbols. But most important: oiaue are ōīāūē, and the keys directly rightdown of them are óíáúē. Option and shift show some more special, often used symbols. In addition we have ŌĪĀŪĒ on the vowels and ÓÍÁÚÉ to the rightdown of them. On the upperleft key the fakauʻa has temporarily made place for the backtick, in case you needed it. After hitting option-M some letters get a new meaning: there is a macron over them, both in lowercase and uppercase, while the space gives a standalone macron. This is an alternative way for making the toloi. Even though some letters are not relevant to Tongan, they may come handy elsewhere. Also notice the boxed numbers. After hitting option-` (option-FAKAUʻA) some letters get a new meaning: there is a grave accent over them, both in lowercase and uppercase, while the space gives a standalone grave. Even though these letters are not relevant to Tongan, they may come handy elsewhere, such as in French names. Also notice the subscripted numbers, handy in fractions or in chemistry such as H₂O. After hitting option-X some letters get a new meaning: there is a acute over them, both in lowercase and uppercase, while the space gives a standalone acute. This is an alternative way for making the fakamamafa. Even though many letters are not relevant to Tongan, they may come handy elsewhere. Also notice the superscripted numbers, handy in fractions or in mathematics such as y=x². After hitting option-Q some letters get a new meaning: there is a circumflex over them, both in lowercase and uppercase, while the space gives a standalone circumflex. Even though these letters are not relevant to Tongan, they may come handy elsewhere, such as to indicate operators in quantum mechanics. Also notice the small, circled numbers. After hitting option-N some letters get a new meaning: there is a tilde over them, both in lowercase and uppercase, while the space gives a standalone tilde. Even though these letters are not relevant to Tongan, they may come handy elsewhere, such as the ñ in Spanish names. Also notice the large, circled numbers. After hitting option-Y some letters get a new meaning: there is a dieresis over them, both in lowercase and uppercase, while the space gives a standalone dieresis. Even though these letters are not relevant to Tongan, they may come handy elsewhere, such as in German words. Also notice that the numbers have now a dot behind them. There are also keyboards for Māori (they have āēīōū, in the same way as Tongan), and Hawaiʻian (who have in addition the fakauʻa or ʻokina). But their ʻokina is over the apostrophe. Would that not have been handier and more natural than having it over the backtick? One may argue about that, but in our opinion it is not. Especially not when using programs like Microsoft Office, which automatically change the single and double apostrophe in curvy single and double quotes. That is a handy feature, which would be missed otherwise. Also the backtick sorts at the end of the alfabet, where in Tongan the fakauʻa is supposed to be. WHERE ON THE FAKAMAMAFA ? A long time ago, in Churchward's dictionary time, it was clear: just on top of the vowel as any European acute accent would be. But in the 1990s and 2000s it became customary to shift it to the right, the vowel plus a seperate accent. But that was too much. So an intermediate position was chosen, and Tongan fonts were made with the fakamamafa slightly shifted. Nowadays however, we are back on the originals, straight above, so special Tongan fonts are no longer needed. Except that the fakauʻa is not always available in the standard fonts. 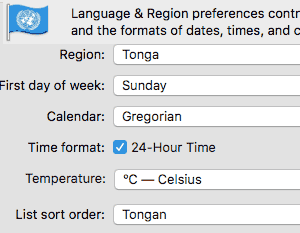 Once you have selected the Tongan list sort order (left) in the system preferences, ng (or use ŋ if you wish) is a single letter after n, and the ʻ (fakauʻa) comes at the end. The Finder directly lists your folders in the right order. Not all programs are that obliging, however. In the universal order (right) the ʻ comes after the h, and ng are 2 seperate letters. The system can automatically make single and double quotes looking nicer. 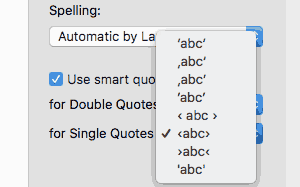 Smart quotes work in most text editing programs, such as Pages, Textedit, etc. However Microsoft Word has its own implementation. Convert to what? Single quotes ‘ ’ are typical British, double quotes “ ” typical American.They are the worst examples Tonga could follow, because they curse with the fakauʻa which almost looks the same, especially at the start of a line. ʻAngaʻofa' is ‘Friendly [islands]’ (in quotes) or a lovely shark? Tongan would be much better off by following the French guillemets. «ʻOtu motu angaʻofa».